Now that I'm eating clean and healthy, I find myself taking some liberties with food definitions. There was the "cheese" I created out of cashews, which some French friends had to call me out on as not truly being cheese. There was no dairy used in the making of that "cheese," but I did use all natural ingredients that had a taste and consistency similar to cheese. In that same vein, I bring you meatless meatballs. Lentil-balls didn't sound right nor does non-meat meatballs, so I give you Vegan Lentil Mushroom Meatballs, so you kind of know what it might look and taste like. These vegan meatballs don't actually taste like meat. I think they taste way better. You get deep savory notes from both the lentils and mushrooms, but then there's some Sherry Vinegar to perk things up so it doesn't get too heavy. You can serve it on zucchini noodles, or on big butter lettuce leaves with my cashew cheese. 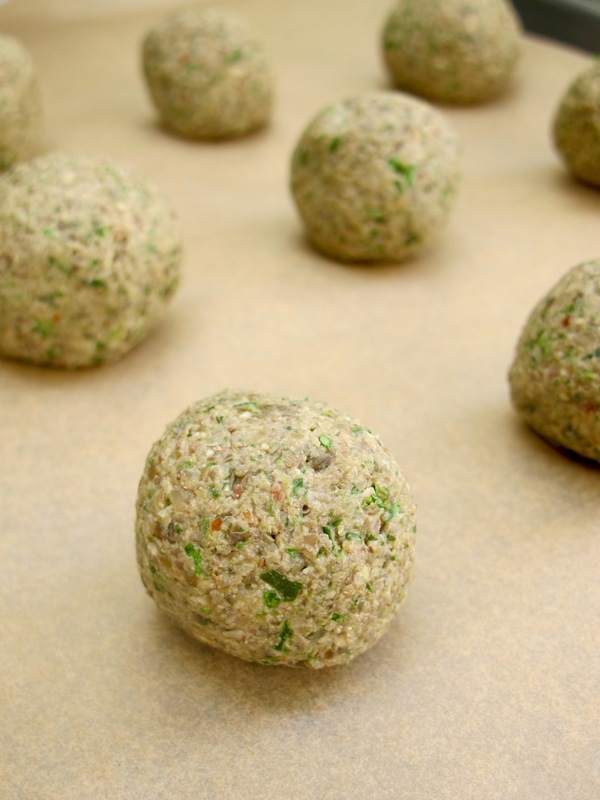 I even tried these lentil meatballs with a cashew cream that combined cashews, lemon, garlic, tahini and water. Throw the cream on lettuce, fold it up and enjoy a vegan, gluten free and dairy free lunch, no matter what you want to call it! Preheat the oven to 400. Rinse the lentils under cold water and add to a small sauce pan. Cover the lentils with water so they're submerged with 1-2" water above them. Generously salt. Bring to a boil, then reduce heat and simmer for about 10 minutes until they begin to soften, but stop before they're too soft since you'll finish them in the oven. Drain and set aside. Heat a large skillet with coconut oil and once warm, cook the onions until translucent and then add the garlic and mushrooms. Season with salt and pepper. Once the mushrooms have browned and released all of their water, remove from heat. Place the gluten free oats and walnuts in a food processor and pulse into a fine consistency. Feel free to leave some walnut chunks. Set aside. Add the mushroom mixture to the food processor and combine with the lentils, flax egg, spinach, parsley, basil, oregano, thyme and vinegar. Pulse until mixture is combined, but not perfectly smooth. Add the walnut oats flour, pulsing until the mix takes shape and solidifies. Make small rounds with the mixture, rolling them between the palms of your hands. Place on a baking sheet and then bake in the oven until set - about 20-30 minutes. Serve on zucchini noodles or with cashew cheese on lettuce leaves.